As your family gathers over the holidays, take some time to have a conversation about your family history. Is anyone in the storytelling mood? Record their stories (if they have no objections to being recorded). 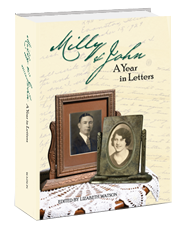 Does anyone in your family have letters, diaries, journals or scrapbooks from past generations? Friend Nora perhaps you will be more surprised than pleased when you read this note. [M]y object in writing to you is this. I wanted to ask you if I could come out to your house next Sunday or the Sunday evening following. I should like to take a drive over the north country and maybe stop at Bedford if it suited. Please answer this so that I will know that you got it if you wont tell me I can come. If you tell me I [can] come please say which evening next Sunday or a week from then. “Friend Nora” was my great-grandmother, Nora Jane Hardisty. She was 17 years old at the time. I don’t know anything about Arthur White nor whether Nora accepted the request to go for a drive. Perhaps she did. She did keep the letter, after all. I love this little letter for the brief glimpse into Nora’s life and for its unique size – the envelope measures 3-1/8 x 2-1/4 inches. 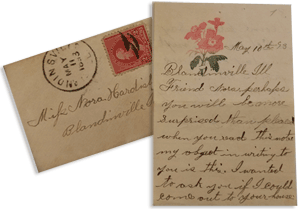 Handwritten treasures like Nora’s letter need to be protected and shared. Digitizing and organizing your handwritten treasures into a print book is a gift to give your family at any time of the year. Begin today to create a gift that your family will cherish for years to come. Do you have an item in your collection that you cherish? Please share about your treasure in the comments below.